Overcoming limitations against their own hearing shortcomings fueled the desire for Khaula and Amina to advocate and improve educational access and outcomes for learners with physical challenges through education and arts. 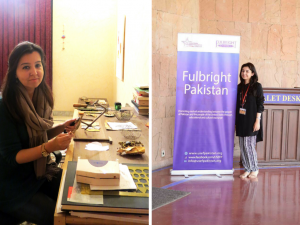 Khaula Rizwan is currently pursuing a Master’s in Special Education at Boston University’s School of Education on a Fulbright scholarship. She has previously taught at Lahore Grammar School and Lahore Speech and Language School where she was involved in teaching science and basic skills resources for students with deafness and multiple disabilities. Upon her return to Pakistan, she hopes to become an inclusion specialist and work with mainstream educational institutes towards greater inclusion of students with disabilities. 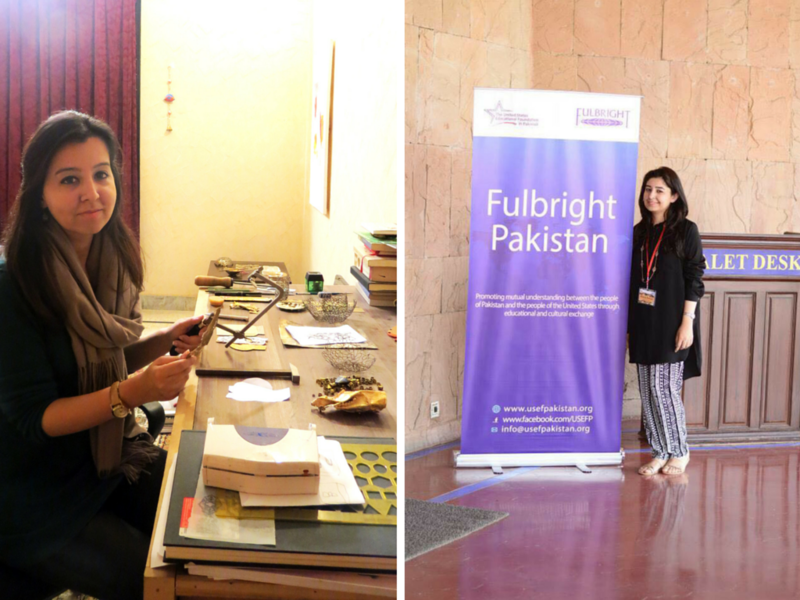 A recipient of the Fulbright Scholarship, Amina Rizwan graduated from the Cranbrook Academy of Arts in Michigan, with a Master’s in Fine Arts in Metalsmithing. Her works have been exhibited at Galerie Marzee, Netherlands, Cranbrook Art Museum, Michigan, Macy’s Gallery, Columbia University and PNCA, Islamabad. Currently an Assistant Professor at Pakistan Institute of Fashion Design, she also taught at Beaconhouse National University in Lahore. Amina works as an independent artist, contemporary jewelry, and objects designer and is also a contributing writer for international art and jewelry magazines. Amina Rizwan: Let’s start by talking about the use of labels when it comes to describing people with disabilities or people with special needs. It is worth mentioning that words like “abnormal”, “mute” or “dumb” have a devastating impact on the identities of these persons that stretches far beyond their academic and social lives. Do you think this is due primarily to an absence of educational awareness? Khaula Rizwan: Well, Pakistan has come far, in the sense that we have gradually raised awareness for inclusion and the rights of persons with disabilities. On a positive note, a few organizations exist which promote the use of politically correct language. However, I still feel that we have not really accepted “inclusion” in its real sense. People with disabilities are largely marginalized and their social status and educational advantage depend on their privileges. Educated and privileged families are able to seek higher quality medical and educational services, both nationally and internationally. My major concern is usually for the less advantaged, who are endlessly fighting to have access to basic services to increase awareness and develop self-advocacy skills. AR: Yes, we grew up in a country and at a time with sub-par resources and sub-optimal facilities for individuals with special needs. Though this was a challenge, educational awareness in addition to counselling, and the support of our families and teachers, greatly helped overcome social challenges. KR: As someone now studying at Boston University, I almost forget my challenges given the seamless accommodation, acceptance and respect I am able to maintain here. On every orientation and introductory lecture, we are explicitly taught how to communicate with all kinds of students, professionals and community caretakers. I cannot say that I have had a hard time remembering the challenges I faced growing up. In one way, they are part of our past. All the times spent struggling during school and college, but on the other hand, they also built the base for stronger skillsets that were essential for future studies. We do assume that all human beings have their own identities, and disability is a part of our existence. As a part of diversity, it should be celebrated. AR: Yes, talking about challenges from a first-person perspective, it’s hard to deny that it took time and considerable effort to progress from understanding “low hearing”, to dealing with it practically. Stereotyping and social perceptions sometimes lock you into the belief that you cannot exist or perform like “others” in society. In due course, however, you understand and accept that we are all differently abled and unique. Because challenges are not just limited to the physical realm: there are financial challenges, health-related issues, and many other adversities in our lives. They all help us in growing and pursuing things both rigorously and differently than what convention [would ordinarily dictate]. Using our strengths as assets, one can teach and serve as other productive members of society. KR: I am amused when people pass on stereotypes without thinking about their meanings, “All people who are deaf or hard of hearing should use only sign language” or “special students belong with special teachers in special schools!” Most of the time, I wonder what “special” even means. AR: Yes, like this institute we went to for the deaf and hard of hearing, for one of our surveys and research. I was brought into dimly lit classrooms, students with very low motivation to study and learn, because they teach through tools and resources limited to memorizing text through sign language, with no emphasis on critical thinking, lexical skills, vocabularies or project-based learning. The classrooms and corridors echoed complete silence. To ask my first question, I started speaking and it was met with confusing stares! Suddenly one of the teachers grabbed my arm, pulled me aside and asked with disdain, “How are you even speaking? !” Baffled and thinking that speaking and sound are not only for the ‘hearing’ world, I remember I was so perplexed that I could not even answer her question. KR: Yes, so it reinforces the idea that people who are deaf shouldn’t speak. It should be the prerogative of the students and their family to decide the best communication mode, whether signing or spoken language. The purpose of any communication option is to develop positive identity and self-acceptance. AR: We often talk about disability as a pathology versus disability as an identity. KR: Yes, from a pathological (medical) perspective, one disability model says that the source and root of societal problems results from the disability a person has – that all such negativity stems from perceptions that people with disabilities are a “burden” and must be “cured”. Whereas the identity and bio-social model puts society and government into accountability mode. Inclusion has to be a two-way street. I’m not saying the person with a disability does not have any disability or doesn’t need attention or care, but that they should not be thought of as a societal liability and left unattended. He / she has limitations but it is the responsibility of the community, educational sectors and the government to make sure that students with disabilities are educated, respected and taught at the same standards in all spheres of life with their mainstream peers. Segregating them to a separate location or a community setup increases discomfort, marginalization and rarifies an overall sense of awareness among the masses. We do assume that all human beings have their own identities, and disability is a part of our existence. As a part of diversity, it should be celebrated. AR: I never thought about “inclusivity” from social and academic perspectives until I was challenged in my role as a professor and having taught three hard of hearing students at Beaconhouse National University, Lahore. Previously, I thought inclusion was more about integrating the physically challenged or individuals with special needs in mainstream educational sectors. But in the larger context, it grapples with deeper concerns: empathy, acceptance and self-esteem. These core qualities shape both individuals’ narratives and identity in a culture, and can also challenge and change the perceptions of teachers in mainstream schools. They would therefore assume responsibility for stretching the students’ limitations into strengths, to help them develop a stronger skillset and independence to ease their transitions to adulthood and subsequent employment. Empathy and acceptance need to be an educational dialogue in themselves, in and out of classrooms. KR: How do we teach and model empathy? Depends on what kinds of systems we are observing. For example, if it’s a top-down approach, every school management and administration should not only be aware of the government’s policies and stance on inclusive education (National Policy for Persons with Disabilities, 2002; National Educational Policy, 2009) but also work on making their schools as inclusive as possible. This would necessitate principals’, general and special educators’ training and continued professional development in the types and prevalence of disabilities in their communities and schools, curriculum and classroom accommodations, and individual education plans. From my own experience with teaching in a mainstream school as a hard of hearing teacher, I have had colleagues who were open-minded enough to reject the idea of segregated education systems such as “special schools” for the deaf or the blind. But they also asked questions about the practicality of such inclusion: How does it work? How will the general and special education teachers collaborate? What kinds of accommodation would be needed? I really think these are the questions general education teachers and principals should be asking, to initiate a dialogue that would drive the education inclusion process forward. They would also need to think what aspect of disability makes them uncomfortable, the opinions of parents and peers, and adjustments for students with disabilities in mainstream classrooms. In my opinion, only a few schools – I can count them on one hand – have embraced this model in Pakistan. When your disability rights are safeguarded rather than neglected – through acceptance and respect – your identity as an individual with special needs gains an altogether new definition. AR: And at the higher education level, deans and professors need to embrace greater diversity in their student population. I feel schools and universities need to devise and implement effective strategies for educating and training teachers and professors on inclusive education. The willingness to accept shortcomings, failures and continued relearning needs to stem from every parent, student and teacher. Inclusive education, which is a highly complex endeavor, would then be widely regarded as a sustainable, humanistic and acceptable system of education for every kind of student. KR: At the same time, I also question the existing Pakistani education policies. Are the policies put forth by the government implemented? Are they transparent? No country can run on vague and unclear policies. Here universities play a powerful role in any community, to educate and train the teachers, to review and suggest amendments in inclusive education policies, and include the feedback / suggestions of students with disabilities in the policy review process. AR: From my post-graduate experience at Cranbrook Academy of Arts, which I attended on a Fulbright scholarship, they do not advocate segregation. Communities in the U.S. mobilize and accommodate people with disabilities in all sectors of society. When your disability rights are safeguarded rather than neglected – through acceptance and respect – your identity as an individual with special needs gains an altogether new definition: one of stretching your barrier into a useful commodity for both yourself and society. This inclusion seems to be an integral part of their “belief” which in turn drives the whole culture of inclusivity with respect and empathy. That said, what are some of the salient aspects you noticed about the special education discipline you are pursuing at Boston University? KR: Here at Boston University and in the State of Massachusetts in general, there is a constant effort on the part of policy makers, professors, researchers and teachers in classrooms to link educational and behavioral theories to practice, and from practice to drive theory. The idea is, what worked for students in one context during a particular time, may not work in today’s classrooms. American classrooms are increasingly culturally and linguistically diverse, and the presence of students with disabilities are considered as opportunities for teachers and school management to revise, review, and implement new teaching methodologies. As per the No Child Left Behind Act, schools are held to a greater accountability to provide research-based intervention strategies to all students, regardless of their limitations. I am surprised and often taken aback by the level of acceptance and tolerance that people in the U.S. maintain for each other, often giving their time and resources to issues that benefit society on the whole. I believe we can initiate the change we need in Pakistan, especially in positive advocacy, teachers’ training and developing curricular and technological resources for students with disabilities in mainstream classrooms. If you are part of our alumni and would like to see your pieces published in the newsletter, drop a line to our Alumni Relations Department.